This article is penned down by Mr Gaurav D Bijoor. Mohammed Rafi can be truly described as the uncrowned King of Melody and also the Greatest Ever – whose simple name will always spell sheer magic. In his astonishing career spanning almost 36 long & patient years from the year 1944 – “Gulbaloch” to 1980 – “Aas Paas” he has been successfully associated with more than 30 female play back singers ranging from the most to the least popular category and with these singers Rafi Saab the dynamic has had the unique golden opportunity of rendering either one OR more songs, equally with class & beauty of its own. Though the list of the female singers so associated with Rafi Saab is lengthy the same in a nut shell can be considered ranging from the “Malika –e-Taranum” – Noorjahan to Anuradha Paudwal in general. From the exhaustive list the few great & very popular female singers include Noorjahan, Khursheed, Lata Mangeshkar, Asha Bhosale, Samshad Begum, Suraiyya and Geeta Dutt in particular. In this respect I recollect from my dear father Mr D P Bijoor that Rafi Saab had rendered only one duet each with Noorjahan & Khursheed. With Noorjahan, Rafi Saab has sung the duet from the film “Jugnu” (1947) which recites “Yahan badla wafa ka bewafaee ke siwa kya hai” with music scored by Feroz Nizami and with Khursheed he has sung the song from the film “Aage Badho” (1947) which recites “Sawan kee ghata, dhire dhire aana” under the music composition of Sudhir Phadke. Rafi Saab had sung only one song each with these great singers mainly since after the partition took place in the year 1947 they both preferred to migrate to Pakistan and hence there was hardly any opportunity for Rafi Saab to further associate with them. The maximum quantum of the duets sung by the Melody King Rafi Saab are with Asha Bhosale which range almost to the extent of 806 songs approximately followed by Lata Mangeshkar with almost 344 songs approximately & Samshad Begum with almost 184 songs approximately. The decade from 1941 to 1950 can be considered as the golden period mainly on account of the entry of the aforesaid great & popular female singers in the industry including the entry of the Melody King Mohammed Rafi Saab. However in-spite of these great, popular and already established singers, there was an entry of a very talented, sweet & melodious voice owner in the industry in the early decade of 1950s with the name of Suman Kalyanpur (nee Hemady), who had a voice culture so very similar to that of the Melody Queen Lata Mangeshkar. Few of the songs which Suman has rendered are extremely difficult to recognize as to whether the recitation is the work pertaining to either Suman Kalyanpur OR Lata Mangeshkar. In-spite of the very tough competition directly from the established & proven melody queen, Suman with her sheer hard work & determination became very popular and was a house-hold name to reckon with in those days; but I personally feel and I am of the firm opinion that Suman Kalyanpur did not receive the due accolades and also the recognition from the industry big-wigs which she deserved a lot. Sheer bad luck Sumanjee. Suman Kalyanpur was born on 28th January 1937 in Bhavanipur situated in Calcutta (Bengal before partition) however in the year 1942 their family shifted from Dhaka to Mumbai when Suman was hardly 5 years old. She recorded her first song at the Bombay Labs at Dadar, Mumbai for the Marathi film “Shukrachee Chandanee” with music scored by Yeshwant Deo in the year 1953 however this film never got released. While recording her first song the then popular music director Mohamad Shafi was also present in the recording studio and he liked and admired the voice of Suman very much and eventually gave her the required break in the hindi film “Mangoo”. This film was produced by Shaikh Mukhtar productions and was directed by N N Ansari. Mohamad Shafi composed his first song with Suman titled “Koyee Pukare dhirese juzhe” which was actually in the form of a loree. For this particular loree the aalap in the middle of the song was rendered by none other than Hemant Kumar and Bela Bose. Considering the beauty of this recitation Shafi decided to record a couple of more songs with Suman Kalyanpurs voice for this film which were “Chanda sangh tare kare atkheliya” with Suman, Usha Mangeshkar & Savita Banerjee (Salil Choudharis wife) and a duet with Talat Mahmood. All the songs of this film were ready for release but at the last minute the music director of this film was abruptly changed from Mohamad Shafi to O P Nayyar who except for the loree song of Suman cancelled all the other songs as enumerated above. However the loree song became very popular and this started the career of Suman Kalyanpur in the industry. Immediately in the year 1954 she got the film “Darwaza” with music by Nashad in which she rendered 2 solo songs “Aag lage iss sawanme” and “Chute tumse tho chale hum” and a duet with Talat Mahmood “Ek dil do hai talabgar” which became very popular & smash hit. After the success of these songs Suman bagged films “Shree Ganesh Viwah” with music scored by Chitragupt and “Coffee House” with music by Roshan. 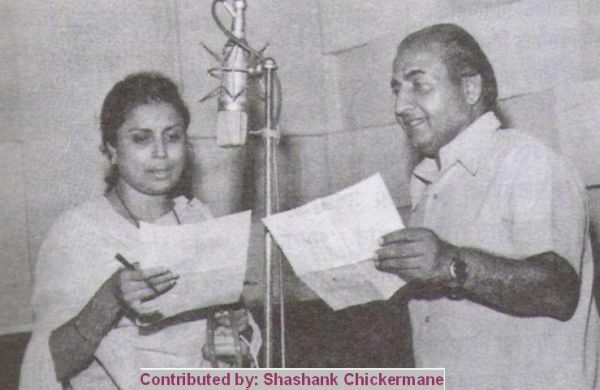 Suman Kalyanpur recorded her first duet with Mohammed Rafi in the film “Shree Krishna Bhaktee” and the song was “Sawan megh udhe, thodasa gulal tu bhee le le le le” with music by Chitragupt in the year 1955. In the year 1957 a film titled “Miss Bombay” with Nalini Jaywant and Ajit as the co-stars was released in which Suman had sung almost 3 songs of which her duet with Rafi Saab “Din ho ya raat hum tere sath sath” became a stupendous hit. In the year 1958 Suman sang for almost 13 films in a row and the few of the films from the lot were “Neelamani” with Chitragupt, “Alheelal” with Bhulo C Rani, “Bhala Aadmi” with Nissar, “Chetak aur Rana Pratap” with Iqbal Quereshi, “Gajgauree” with Sudhir Phadke, “Kal kya hoga” with Nissar, “Light House” with N Dutta and a few others. Though Rafi Saab had left for his heavenly abode in the year 1980 the duets with Suman Kalyanpur which he had recited earlier were released thereafter. A few of them are as follows: 1) “Yah wada pyaar ka irada pyaar ka” from the film Waqt kee Pukar (1984 with music by Bappi Lahiri) 2) “Oh saperan chal chaliye nee sherawali maa ke darshan ko” from the film Yaadon kee Zanjeer (1984 with music by Rajesh Roshan) 3) “Sardar ye mera dil dhadka, kuch tho bataye kahan atka” from the film Maa kee Saugandh (1986 with music by Sapan-Jagmohan) 4) “Gulabee najare najare sharabee sharabee ishaare” from the film Lakhpati (1991 with music by Iqbal Quereshi). The song from the film Lakhpati was Rafi Saabs last song with Suman Kalyanpur and hence they both have rendered almost 141 songs approximately. It may also be noted that the female singers who arrived in the industry after the entry of Suman did not get the opportunity of singing so many songs with Rafi Saab as she did and for this matter of fact the credit should in fact go to Lata Mangeshkar mainly since after the year 1962 the melody queen did not render duets with Rafi Saab for a few years which was on account of the royalty issue and this was in-fact a blessing-in-disguise for the great Suman Kalyanpur. This entry was posted on Sunday, August 23rd, 2009 at 11:14 am	and is filed under Meri Awaaz Suno. You can follow any responses to this entry through the RSS 2.0 feed. You can leave a response, or trackback from your own site. Very fantastic efforts taken by writer,because Sumanji was compared with Lataji. Rafi sahab also supported her,for the career.That time both were sung the duates songs are so evergreen. Yes , to some extent it is a fact that Suman Kalyanpur was indeed a great singer and failed to get the recognition she should have received. Her songs were Lovely. And her duets with Mohd Rafi was nostalgic. Rafi sahab was the greatest singer we ever had, and everyone knows there wont be another Rafi in this Century. Bollywood and playback singing owes Rafi sahab what it is today. My sincere salute to Rafi Sahab for his unforgettable contribution to the Playback singing and Bollywood. I think nither you watch TV nor read paper ! Please watch reality shows how people treate her and respect her ! LATA is beyond comparasion ! I don’t want to talk about other singers !!! Truth is well known to the whole world still people assume and write rubbish in the forums. I feel pity for them. his name to my son.still i am not happy since i could not see him. of rafi saab.they can forget the death of their relatives and friends. that.i must say he is just like a rose flower which can provide honey. Thank you Dr. Aliudeen saab. Eid mubarak to you and all your dear and near ones. To day was the last day of Holy month of Ramadan. By the Grace of Almighty, we will celeberate “EID”, tomorrow i.,e, Sept.,9,09. Post 41: How about the title song of Dev Anand-Asha Parekh starrer “Jab Pyar Kisi Se Hota Hai”? This song was sung separately by Rafi Saheb and Lataji and both songs were happy versions. But see, how Rafi Saheb sang it far better than Lataji. People even do not know if Lataji has sung this number? Rafi Saheb’s track is always played in the radio and/or TV.